Powder, the rogue-like dungeon crawler, has received an update. Remember that save files are never transferred, play until you die, and then upgrade. Please see the change log for more information. • When fully charged spells will get a yellow glow so you can tell 99% charge from fully ready. • Tame creatures whose masters die will go wild after five turns and be also confused. You now have a good reason to go after the leaders of rooms first. • Radius of the burst when bottles break is dependent on curse/blessed status. • New POWDER icon thanks to Sam Goldfield! • Being poisoned by something more powerful will properly clear the weaker poison. Going to have to check out the SDL version one day soon though. I'm gonna pick this up (again) once I finish Pokemon Mystery Dungeon (Explorers of Time). 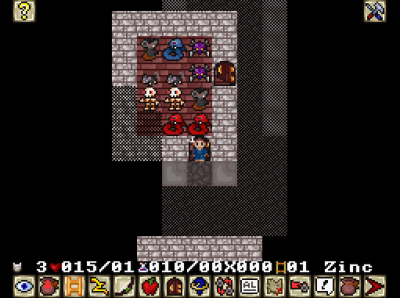 The PKM MD are a tad easy for roguelikes btw, so POWDER will be a good change. [Request] Powder Toy 3DS Homebrew?